Let’s get straight to the point : an imposed decorum, four walls and a few windows, functional needs to sleep, read and wash. Two internal bodies that embrace the envelope without touching it, opaque, translucent, airy, abstract. An unfinished surface of 96 square meters : walls made of terracotta blocks, raw concrete ceiling, windows on two of the four walls and two technical ducts. Design it for a couple who want a loft conversion type of interior design with efficient use of space. Creation of a minimum of two new volumes and use of a very limited set of materials. Two volumes are built and three pieces of furniture are installed to structure the volume. The two metallic volumes on the ground floor welcome the two functions that requires doors that close : the bathroom and the laundry room. The top floors of the volumes conceal a bedroom and an office. The position of these volumes alongside technical ducts determines different volumes with different qualities. 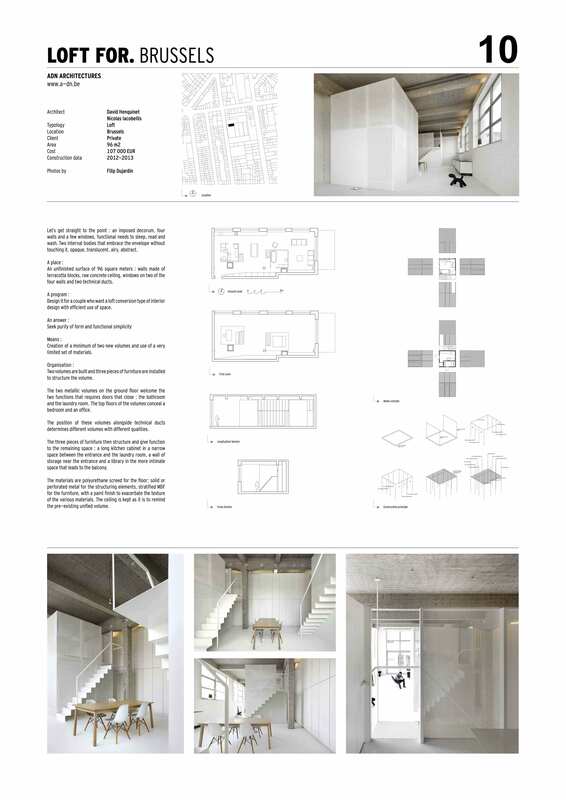 The three pieces of furniture then structure and give function to the remaining space : a long kitchen cabinet in a narrow space between the entrance and the laundry room, a wall of storage near the entrance and a library in the more intimate space that leads to the balcony. The materials are polyurethane screed for the floor; solid or perforated metal for the structuring elements, stratified MDF for the furniture, with a paint finish to exacerbate the texture of the various materials. The ceiling is kept as it is to remind the pre-existing unified volume.